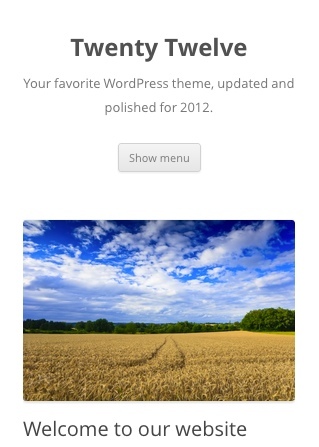 The new default WordPress theme for 2012 has arrived. Just a few days ago, Twenty Twelve was made available to WordPress.com users, and it will be released on WordPress.org “very soon“. Designed by ex-NFL player turned web designer, Drew Strojny, it has a lot to live up to. After all, this is the theme that will be bundled with every single new installation of self-hosted WordPress upon its release. New default WordPress themes are typically greeted with a lukewarm response from certain sections of the WordPress community. They are seen by some as nothing more than a theme for beginners – not something that one would actually plan to use. But reading Strojny’s posts over at The Theme Foundry blog reveals a desire to develop a strong standalone theme that anyone would consider for their own site. The question is, did Strojny achieve what he set out to do? As you are no doubt aware, mobile web usage is a major consideration for web designers these days. One must consider how a design looks across multiple platforms, screen sizes, and resolutions. And whilst Twenty Eleven features responsive elements with its design, Twenty Twelve is the first default WordPress theme to offer a fully responsive experience. In fact, the official WordPress.com blog goes as far as to call it a “thoughtfully crafted mobile-first layout”, demonstrating how important mobile design was considered during the development of the theme. The portrait display on such devices results in the navigation bar wrapping onto a second line, which looks somewhat unappealing to my eyes. That is however a minor complaint. The way in which the navigation menu is hidden and revealed is far more elegant than the drop down menu option that you see on a lot of responsive designs. Responsive design is a complicated and potentially costly area of theme development, but Twenty Twelve offers up a near-flawless responsive design, and will be available at no cost. I would be the first to admit that I am a huge fan of typography. And yet, it is something that many theme designers do not seem to prioritize. In my opinion, the attractiveness and readability of written content should be one of the most important considerations in web design. With that in mind, I was delighted to see how important typography clearly was in the development of the Twenty Twelve theme. In short, it looks fantastic. Elegant and perfectly readable — the two things you want from a good font. Not only that, but Twenty Twelve comes complete with inbuilt language detection, and will deconstruct to a more suitable font if the user’s language is not supported by Open Sans. Any web designer worth his or her salt knows that the primary function of a content-driven website should be to facilitate the easy assimilation of said content. This is achieved by a number of means, such as the aforementioned typography, but also by the layout and navigational elements of the design. Twenty Twelve’s minimalistic design is an excellent example of how to prioritize easy navigation and content assimilation. The navigation bar is prominent, and the abundance of whitespace makes reading the content a comfortable experience. Furthermore, the sidebar is now available on all pages, so that you can easily provide additional navigational elements such as categories and tags. But that’s not all. Twenty Twelve has taken a big leap forward from its predecessor in offering full customize ability regarding the placement of the sidebar. Whilst it is displayed by default, you can remove the sidebar from specific pages by choosing the “Full width page, no sidebar” page template. Alternatively, you can remove the sidebar altogether by emptying it of widgets. Twenty Twelve’s full width display. Finally, the oft-maligned banner-style custom header images and featured images are now turned off by default (but can still be activated). One of the great features of Twenty Eleven was its multiple post formats, which gave users the power to create Tumblog-style blogs whilst retaining the power and extensibility of the WordPress platform. Each post type offers up its own unique look, which remain consistent on both list and single post views. Whilst WordPress is primarily a blogging platform, it is capable of doing far more — it can easily be utilized as a fully-featured content management system. Twenty Twelve has clearly been designed in part to showcase WordPress’ versatility (and also perhaps as an advertisment that it is not just a blogging platform), by offering a static homepage template. You can now add introductory content (be it text, images, video, or a combination) at the top of the page, and utilize a homepage-only widgetized area below. Will You Explore Twenty Twelve? 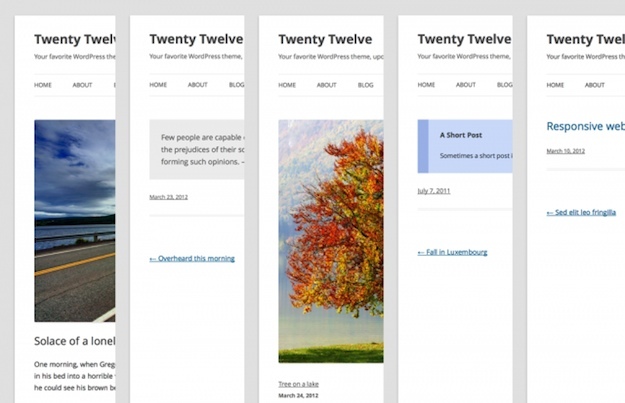 I consider Twenty Twelve to be a great option for WordPress users. It is certainly a great beginner’s theme, but that does not define its sole purpose. It is an excellent standalone theme in its own right, and serves as a great example of how to design websites with functionality and ease-of-use in mind. With that said, do you agree? Will you be taking a closer look at Twenty Twelve? Let us know in the comments section! I came back to thank you for writing this article. It has made all the difference to me! When I wanted to build a new author website (my old one was from 2005 and very antiquated-looking) I wanted to make it into a WordPress site instead of using Dreamweaver. But the WP themes I’ve tried on my other blogs all had shortcomings I didn’t want to inherit. After doing the usual frustrating search for a new WP theme, I googled something right and it brought me here. I was highly skeptical when I arrived (always having viewed the WP default themes as too generic) but by the end of the article I was convinced. I installed it with no hitches, made the website front-and-center and the blog as just one of the offerings (it was surprisingly easy to find and activate that setting) and built the site. I’m extremely pleased with the results! I like Twenty Twelve so much I might switch all of my blogs over to it. Hi Tom, For some odd reason I can’t get comments to work on my pages or posts…I am using Twenty Twelve 1.1… love it otherwise, but can’t seem to find how to get the comments on my blog…any advice? Liz. This theme is easy to install and customize. Anyone has any details of the new Twenty Fourteen? Should I update to 2014? Thank you for this great post! I have been happily building my site on wp 2012 over the past 2 months. I just have a question for you; is it possible to remove the date/time/identification of each new post without getting into coding or creating a child theme? I would like my posts to be read as information about my artwork, as opposed to daily postings. I used Twenty Twelve fr all of my eight websites and couldn’t recommend it enough. The new 3.6 Twenty Thirteen looks very weird to me, it doesn’t look professional, just like for kids! There are many tips and advices on how to optimized for SEO and the latest Twenty Twelve 1.2 is very powerful. I came across your site while searching for free wordpress theme and i found it very much impressive. Using the awesome 2012 theme on a number of websites. Had the hack the theme a little. The default wp themes can be ugly. I have found this one to to clean and very professional. I like the way twenty twelve looks. Apart from that for begginers using a well extended theme makes easier to find problems. By the way I like the floating sharing bar in the left. May i ask you which plugin do you use to get that?. I can get only 3 tags within my menu. Is this a limitation of 2012 or is it me? Do you know how to disable responsive design? I’m sure it would be possible to do that, but since Twenty Twelve is so heavily focused on responsive design you might be better of choosing another theme. I installed twenty twelve theme today on my blog outsourcepk.com, do you have any idea how do I increase the sidebar width? Thanks Tom for this great review of 2012. I just happen to be looking for a simple but great looking theme and voila here it is! I’ve just installed it on my personal site and at first glance I have to admit that I’m positively surprised. I still need to do some tweaks to it but I’m confident that I can achieve what I want with it. I have been experimenting with 2012 theme and, like 2011, it’s a great, easy-to-use wp template framework. I say framework because it has a lot of functionality built that saves time coding, like get_template_part. Also, if you want to deconstruct a responsive template to see how it works, 2012 is a great place to start. Finally, if you want to build custom templates, 2012 is a great template to start with. There is one thing I’d like to see improved: the mobile menu. Currently, it’s just an unordered list that does not show the hierarchy of your links. You’re lucky – my ‘menu’ is just grayed out. 🙁 Bug? I actually did the site first in Twenty Eleven, but when I checked it on my iPhone I didn’t care for the way it looked. Twenty Twelve looks really good on my iPhone. It would be fantastic if you could help me restore my sidebar on Twenty Eleven. Tech support on Blue Host couldn’t help. And nothing I’ve googled and tried has helped restore it. I must have emptied all of my widegets and have been unable to get them back. When I put “sidebar” in the search engine another page comes up that is not on my site and it had the sidebar there. Lori, I’d like to try to help but I’m not sure I understand your comment about the search engine. Also, when you say “restore,” do you mean that your original sidebar content was lost when you changed themes? If so, you may just need to re-create it, if it wasn’t saved anywhere. Sorry you’re having a problem (so frustrating). I’ve just installed this on my blog and it looks great. Only problem is I can’t see how to work the featured post bit. Ideally I’d like to turn it off but I don’t know how to make a post featured either. Not sure off the top of my head Joe, but at a guess, perhaps make it Sticky? You’re right Tom, sometimes the best option for most is something hiding in plain site (sic). Tom, thanks so much for this post. I have used the 2010 and 2011 themes and have actually been happy with them, so 2012 sounds like a great update. 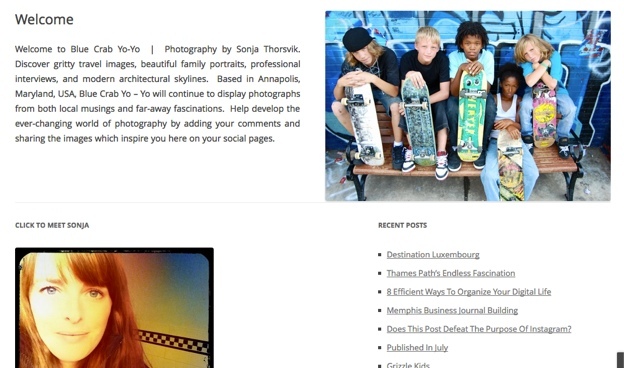 I’m about to move a basic Blogger site to WP, so I think I’ll give 2012 a try. Thanks again for the great details here.